This is a new "Guide for the Perplexed" title providing an examination of bioethics that will couple Christian and philosophical perspectives.In this "Guide for the Perplexed", Agneta Sutton understands Bioethics in a wide sense which includes issues in medical ethics and questions concerning our relationship with animals, plants and, indeed, the whole planet Earth. The key question is that of the value of life. This, then, yields the questions of what respect we owe to human and other forms of life and of how we should care for the world in general.These questions are approached from a Christian perspective and also from more strictly philosophical perspectives. Thus, arguments from a Christian perspective regarding our relationships with fellow humans, other creatures and the planet, are coupled with discussions of different kinds of argument and counter-argument.Continuum's "Guides for the Perplexed" are clear, concise and accessible introductions to thinkers, writers and subjects that students and readers can find especially challenging - or indeed downright bewildering. Concentrating specifically on what it is that makes the subject difficult to grasp, these books explain and explore key themes and ideas, guiding the reader towards a thorough understanding of demanding material. "This book is a useful introduction for nurses and others who are interested in bioethics with an emphasis on the Christian perspective." Reviewed by Vince Mitchell, Book Reviews Editor, c/o of International Centre for Nursing Ethics, University of Surrey, Guildford, UK. 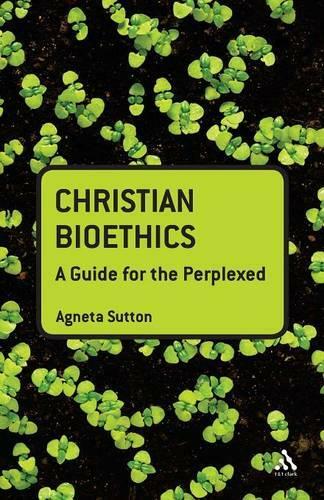 "if you read this book, be aware that for the most part it presents a very selective account of Christian attitudes to bioethical issues. You will need to read it with your mind open, and ask wheter you are being told what to think or enabled to think for yourself" November 2008--Sanford Lakoff "Third Way "